Turnigy Bolt series of high voltage lithium polymer batteries are renowned for their superb power, performance and build quality. But the Bolt is better, now with more power, less resistance the version 2 has been unleashed. Turnigy Bolt version 2 batteries are built to the absolute highest of standards to provide competition level performance. With features such as gold plated balance leads, silver plated discharge wires and a reformulated matrix to allow you to safely charge them up to 4.35 volts per cell! These batteries are simply unmatched by any other in performance and build quality! In addition to the higher nominal and max voltage, they are engineered to take high C rate discharge up to 65C continuous. Basically what this means is that these batteries will provide more power in your machine especially during high current draw maneuvers, and they will provide a longer cycle life due to the lower operating temperatures of the pack. Designed for high demands of high current applications such as RC racing drones, Ducted fan jets, 3D aerobatics or 3D Heli's. Each pack is built with heavy duty flexible silicone wire leads and a pre-installed connector ready to handle all you can throw at it. The great thing about the Turnigy Bolt batteries is that you can charge them with any standard lipo charger for basic use, they will simply perform like a standard pack. When using the proper charger such as our Turnigy Neutron chargers, which is designed using a special protocol for these LiHV batteries, you can unlock the full potential of the Turnigy Bolt batteries. 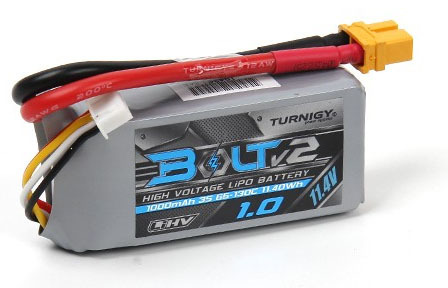 TURNIGY Bolt V2 series of Lipo batteries are built with a LiCo nano-technology substrate complex and an all new CNT (carbon nanotube) additive greatly improving power transfer making the oxidation/reduction reaction more efficient, this helps electrons pass more freely from anode to cathode with less internal impedance. In short; less voltage sag and a higher discharge rate than a similar density lithium polymer battery.